I left William with my wonderful brother and sister-in-law who just moved to Laguna Beach so I could tag along with my sister and her family to Disneyland yesterday. As you may recall, the last time we went to Disneyland I was pregnant and couldn't ride any of the rides. It was still fun but I didn't feel like I got the full experience after an eleven years hiatus. 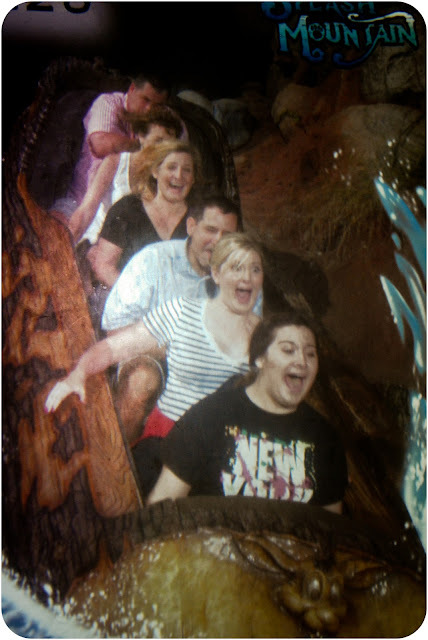 Now, I leave you with this amazing picture of me on Splash Mountain. So awesome. Except that I got so wet that I had to wring out my sweatshirt afterward. So wet that I didn't fully dry off for a solid 6 hours. So wet that I screamed, "I am NOT happy!" during the ride and my brother-in-law (sitting behind me) laughed about that all day and kept saying it over and over. I'm taking my hubby on a date to Dland tomorrow! And then we'll go as a family of 5 on Friday. Some think it might be strange to enjoy Dland as sdults but it ROCKS. We love running around like free spirited youngsters. Thanks for your blog. I love hearing about your SoCal adventures and all of your yummy experience in good food. Oh what a (seriously) glorious day! You sure know how to squeeze out a fun-packed adventure. Sounds like fun! How crowded was Disneyland? Did you stay for the Halloween party at Disneyland? If so, how were the decorations and was it busy that night? Oh my! I know just what it's like to be 2nd in the Splash Mountain raft with 5 other adults. So I totally believe you about not drying off completely for 6 hours. Hopefully you didn't have to stand under the air conditioning vent in Indiana Jones for an hour immediately following because the ride had broken down. Anything for Disneyland though, right! ?